I normally use Babor's 2-step cleansing system to remove my makeup and cleanse my face every night, but since I was back in Malaysia recently (and had very limited luggage space and was on a mission to find good skincare on a budget) I decided to try the Kanebo Freshel White C Cleansing Oil. It retails for just about RM 36 (roughly AUD 12) for a 180ml bottle at Sasa Malaysia, or at Parkson. 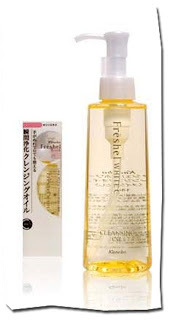 This cleansing oil comes in a great-looking plastic bottle - so unexpectedly pretty for a such an affordable product! It is dispensed via a pump, and, thoughtfully enough, a stopper for the pump has been included for convenient travel. There is a very subtle, slight floral fragrance to this oil, but nothing overpowering and nothing that would be too harsh on skin. I must mention that this product contains mineral oil. I also want to note that the Shu Uemura oil also contains mineral oil. A lot of people tend to stay away from mineral oil because it forms a layer on top of the skin and clogs pores, as well as prevents product absorption. This is not so much a problem with makeup removers, because you're meant to follow up with a cleanser after makeup removal anyway. I am in love with this product! I was given a sample of Shu Uemura's Cleansing Oil after I bought a couple of products from the brand, and I must say that this is just about as good as that! Shu Uemura's product washes off a little more easily with water, but as mentioned earlier, makeup removal is meant to be followed up with proper cleansing, so it doesn't make a difference. Usually, with my other makeup removers, I get makeup excess on my cotton square. It always made me feel like my face wasn't clean enough to go to sleep in. When I started the cleansing routine with this cleansing oil, though, my cotton square always comes out clean. I love it!